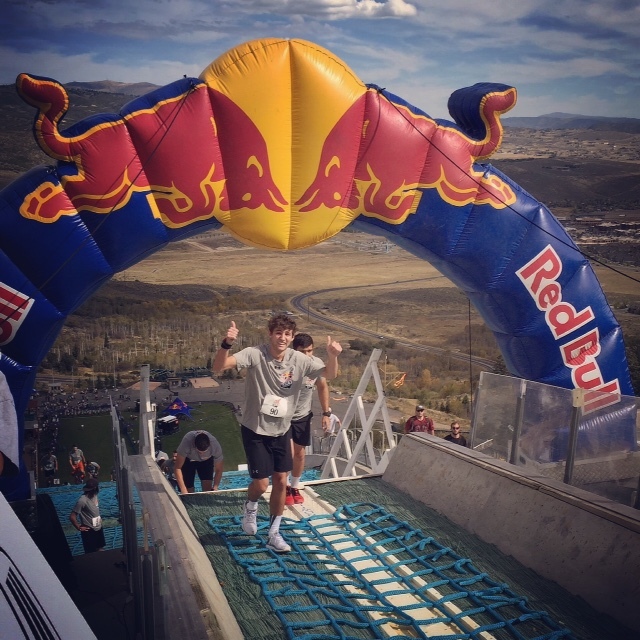 The Red Bull 400 meter uphill race made its American debut in Park City Utah on Sept. 26, and students from colleges across Utah came out to conquer the athletic challenge. The tour started in Europe and ended in the United States, with Park City as the final stop. According to Melanie Welch, the marketing manager for the Utah Olympic Park in Park City, the Nordic Ski Club worked with Red Bull for more than a year to get ready for the event. According to Red Bull, the elevation at the start of the course was 6,870 feet. Welch said the course took place on one of the “older Nordic ski jumps.” Racers ascended 400 meters at a 35-degree incline. Nets coated the entire surface of the course. “You have to keep a low center of gravity and crawl on your hands and feet,” said Lucas Wale, a student at the University of Utah who was one of the competitors. Many students competed in the race for fun and to challenge themselves. “It’s a sense of fulfillment, being able to say I competed in a Red Bull event is pretty cool,” Wale said. “This race is the ultimate thing — hiking and running at the same time,” said Andre Nielsen, a Utah State University student who also competed. The steepest part of the race came between the 200 and 300 meter marks. Nielsen and Wale both said they struggled during this section of the race. “Your body is either going to quit or keep going,” Nielsen said. “It’s about endurance – not skill,” said Parker Ferran, another participant in the race. At the end of all the heats Red Bull took the 50 men and women with the lowest times and entered them into the finals, in which they had to ascend the hill one more time. Wale said he qualified for the finals but had to go to work and could not compete a second time. Ahmet Arslan from Turkey had the fastest time of the day in Park City, finishing with a time of 4 minutes and 5.8 seconds.